"Here at the Consumer Electronics Show in Las Vegas there are some people who view the automobile as an accessory to consumer electronics. Conversely, at the auto show in Detroit there are many people who view consumer electronics as mere trimmings for the car. Both points of view miss the point: as much as a smartphone can be far more than just a tool for communication, a smart car can be more than just a means of transportation. Precisely at the interfaces between communication and mobility, vast potential for innovation lies dormant, and we intend to tap it," says Dr. Dieter Zetsche. With that he launched into a visionary tour of what might be the future of the automobile and transportation systems. The starting point was to name a set of transportation challenges; the environmental and climate effects of burning fossil fuel; the looming scarcity and rising cost of fossil fuel; and the crushing weight of traffic congestion. The paradox is the illusion of freedom offered by automobiles, but in truth comes with the dependencies and side effects just named. The vision offered by Dr. Zetsche is claimed to be a path to solving the paradox. Looking to preserve the role of the Automobile Industry he said "we will not only protect the traditional strength of automobiles, but also make further growth sustainable and create new opportunities. Quoting Jeremy Rifkin who said "Great economic revolutions occur when new energy systems merge with new communication systems" Dr. Zetsche named two previous such revolutions; Printing presses & steam power; Broadcasting & oil. The revolution currently underway is said to be Electric mobility & communications technology. Freedom of Time: The automotive industry moves very slowly with long product development cycles measured in years, while the electronics industry moves extremely fast with fast cycles measured in weeks or months. The latter leads to the fads that come and go, and while we might be able to buy and discard $100 gadgets every few weeks we can't do this with cars. Their answer is cloud computing connecting the infotainment system in your car to Daimler's systems to, for example, enable automatic software updates, secure internet connections from the car, and more. The implementation is the second generation of their mbrace system, named mbrace2. Freedom of Speech: An advanced speech recognition system that Daimler says will actually understand what you say. An example of the power he gave is a car that knows it will be raining at your destination three hours from now, and reminds you to bring an umbrella. "The intelligent car communicates not only with the driver, but also with other transportation modes and its entire environment in order to be able to assess all relevant information for a trip and make practical use of it immediately," says Dr. Zetsche. Freedom of Access: The rising problems with traffic congestion isn't necessarily solved by continuing the system of every person owning their own car. Car sharing systems offer many advantages that include reducing traffic congestion and more importantly reducing the required number of parking spaces in a city. Daimler's car2go experiments underway in seven cities are a car sharing network accessed via smart phones. "In essence it's like cloud mobility," you don't need to own a car but you still have access to one. Daimler is already running car2go in seven cities, and plans to add another 12 cities over the coming year. Freedom of Energy: More specifically, freedom of energy for the post-oil era. It's clear that Dr. Zetsche intends to address the looming problems with fossil fuel supply many know as "peak oil". Electrified vehicles, a.k.a. electric mobility, offers not just a method to clean up automobiles and reduce emissions, but additionally offers freedom of the source of energy to drive the vehicles. Electrons can come from any source, many of which do not involve burning fossil fuels and mucking up the environment. Battery and electric drive technology has reached a tipping point of usefulness where electrified vehicles are beginning to be capable of replacing the usefulness of gasoline powered cars. Note, that is "beginning to be capable", not "are capable". Freedom of Information: The freedoms he already discussed include the presence of improved on-board infotainment systems. An additional step can be taken to gather information from all the cars on the road, to more intelligently manage traffic on the road, or crowdsourcing applied to traffic. The trick is to use information from the cars ahead of you. It can make it possible to avoid traffic jams or to increase safety by alerting drivers to dangerous road conditions such as black ice. 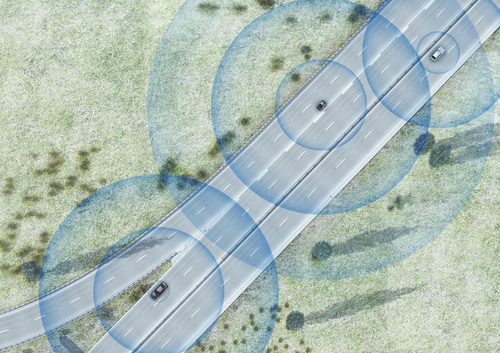 "The connected car is a proactive car" and to provide on-board apps that help you find the most efficient driving routes for your travel needs. Developing a car-air corridor can be one of the pre-requisites and a part of the plan of developing such a vehicle. It will serve as virtual fly overs for exclusive use of internet-controlled-electric-powered vehicles. Such vehicles can have the ability to lift themselves up to a higher level- say 5 meters above the ground and move within a band height of 10-15 meters from that level. As variety of automobiles/ transportation systems will be using the ground and all will not have the same features, the new concept vehicle will not have to worry while moving in a separate channel. It would also eliminate one constraint of controlling movement of such vehicles. It would meet the 'Freedom of Access' criterion mentioned in the article.